Welcome to Bear Pause II. Replacing the original Bear Pause that was destroyed bu the November 28, 2016 wildfires. The Great Smoky Mountains will enchant you when you arrive at Bear Pause II.The spacious outdoor deck just off the living room features two wooden chairs and a wooden bench swing. Depending on the weather, you and your family or friends can choose to enjoy the expansive view of the mountains from the deck, or from indoors. Mountain gazing is also fun from inside as you settle into the quality leather and wood furniture. The scenery surrounds you as you take in all the sights through the living room’s oversized windows. Look up at the sky at night and gaze at the stars and the moon. Share special moments while talking, cooking, reading, or playing games -- this cabin has so much to offer. In the morning sit back and marvel at the sun shining into your bedroom through the trees. Greet the day on the deck and then come inside for a bite to eat; the kitchen features all the appliances and equipment you need to cook your own meals including a Keurig. Your kids will always be entertained with this cabin’s cable flat screen TV, DVD player, and pool table. They will love the loft as their own play space. On top of that, there is a large Free Standing tub in the master (King bed) bedroom. Bear Pause is the perfect family cabin! 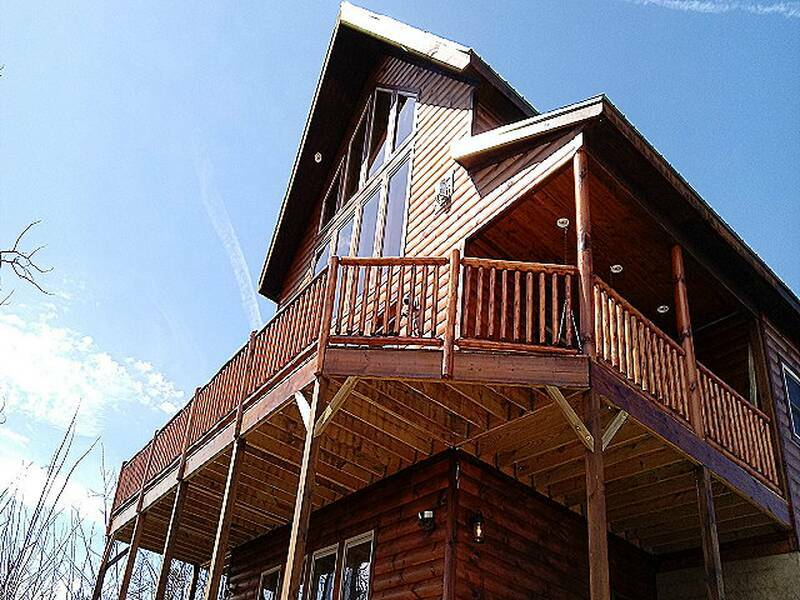 This cabin has 1 King and 1 Queen bedroom along with a Sleeper Sofa in the downstairs area. This is a completely modern unit with all the features you need to enjoy listening music throughout the house with its three level sound system, ultra modern tiled master bath with large shower and free standing tub and double vanity with raised sinks and hand pump style faucets. Elegantly furnished through out with a classy game room including pool table, poker table and a timber top bar area while taking in the mountain views. The kitchen is highly styled with double stainless steel fridge, stainless oven with under cabinet over the stainless microwave and dishwasher. Private hot tub on rear deck with seating and swing. Does include a $150.00 security deposit which is refundable if no damage was done.